In this May 30, 2018, file photo, San Francisco 49ers linebacker Reuben Foster walks on the field at the team's NFL football training facility. Foster was arrested Saturday, Nov. 24, at the team hotel on charges of domestic violence. Foster was released from the 49ers last week after he was arrested on domestic violence charges. Don’t give me any of that “character matters” bull crap. Not from you, Dan Snyder. Not from you, Washington Redskins. I don’t care how desperate you are to make the playoffs. There is absolutely no justification for adding Reuben Foster — who was arrested Saturday in Tampa and charged with domestic battery — to your roster. But a domestic violence charge isn’t a big deal to the Redskins. Sure, they issued a statement from VP of player personnel Doug Williams (no coincidence it came from the only member of the front office beloved by fans rather than oft-criticized team president Bruce Allen or Snyder himself). They claim that they take the allegations swirling around Foster very seriously after yet another arrest. But if they truly did, they would have stayed far away. They wouldn’t have even had a discussion about whether to put in a waiver claim for Foster after the 49ers parted with the 2017 first-round pick following his latest transgression. He was also arrested on a felony domestic violence charge in April, but his accuser — the same woman as in this weekend's alleged incident — later recanted. But they did, and as the only team in the league to put in a claim for Foster, according to multiple reports, the Redskins were awarded the troubled player. 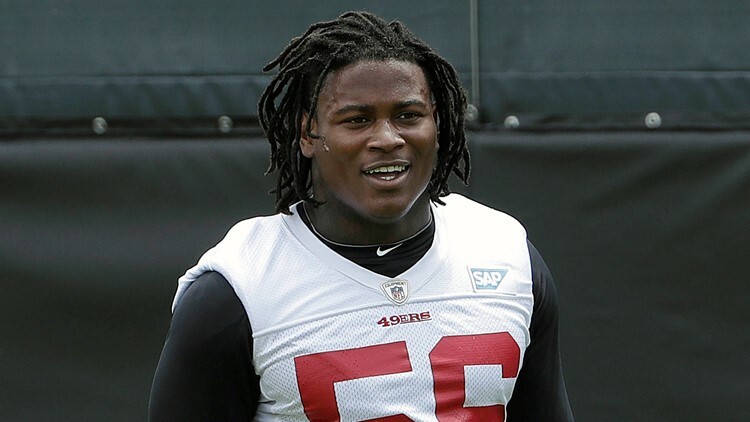 "Today we have claimed the rights to LB Reuben Foster," Williams said. "The Redskins fully understand the severity of the recent allegations made against Reuben. If true, you can be sure these allegations are nothing our organization would ever condone." In 2014, after NFL Commissioner Roger Goodell handed down a stiff punishment to Ray Rice for beating his fiancée, Snyder issued a statement praising the move. So, what changed four years later? Did those at the top of the organization forget how terrible they felt about domestic abuse back then? Redskins officials let character go right out the window. They had fallen in love with Foster leading up to last year’s draft, though they passed on a chance to take him and instead selected his Alabama teammate, Jonathan Allen, with the No. 17 pick. But boy did the Redskins pounce once Foster became available again. Team officials didn’t even consult some of the strongest leaders on the team to gauge their feelings on the move. They just had to have him. Fortunately, the NFL has placed Foster on the commissioner’s exempt list while it reviews the incident that led to his arrest in Florida this weekend. That means he can’t play or even practice at this time. But it shouldn’t have even come to this. No team should have even given Foster a shot. Here’s my question: How will Snyder, Allen, Williams and coach Jay Gruden explain that it’s OK to employ a person that allegedly has abused a woman? How will they teach their sons the importance of respecting women? Will they try to tell their loved ones that it’s OK to turn a blind eye to domestic violence as long as a man has talent? With this move, that’s exactly what the Redskins are saying. Adding Foster indicates that none of those responsible for this decision care about the well-being of women. Taking a stand didn’t matter, because there are quarterbacks to sack and games to win. This certainly isn't the first example of physical ability trumping character. Even these same Redskins took a flier on Junior Galette after the Saints released the pass rusher was arrested on suspicion of domestic violence, though the charge was later dropped. But you know what’s laughable? Last week, Washington lost quarterback Alex Smith to a broken leg. They have confidence in backup Colt McCoy as the new starter but needed to add another quarterback to the roster. The same men in charge of the franchise worked out proven scrubs, but couldn’t give Colin Kaepernick a sniff. Because, God forbid they kick the tires on a gifted athlete who protests by kneeling during the national anthem. But a player looking for work immediately after an arrest on a domestic violence charge? You're good, buddy — at least with this organization — no matter the cost or the offense. Hail to the Redskins!